The UC San Diego men’s basketball team endured some highs and lows this weekend as it took on Stanislaus State on Friday, then traveled to Chico to take on Chico State on Saturday. 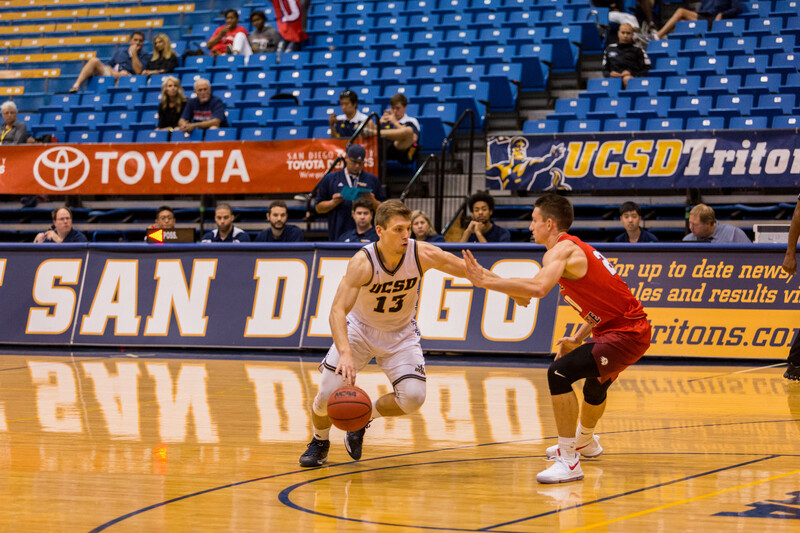 Despite getting back to winning ways with a comfortable 72–54 victory against the Warriors, UCSD fell down to second place in the California Collegiate Athletic Association after a tough 64–69 defeat in Chico. UCSD now stand with a 15–5 overall record and 10–3 in conference play. Coming into the matchup, the Tritons were on a two-game losing streak and what a better way to get back on track than a win on the road? The Tritons looked like they would never be on the wrong side of an upset as they led comfortably for a majority of the game. Senior guard Adam Klie led the way for the Tritons, as he has done countless times throughout the season, with 20 points including seven rebounds and seven assists. Teammates, junior guard George Buaku (12) and sophomore guard and forward Christian Oshita (10) also added double-figure point totals along with a combined total of six three-pointers. UCSD shot 46 percent (27–58) from the field, while also doing a solid job on the defensive end, forcing Stanislaus State into 14 turnovers. When defense turns into offense, creating easy baskets happens regularly and the Tritons did just that with 16 points off turnovers. With the first-place spot at stake on Saturday night, the two teams had that much more to fight for. Unfortunately, the Tritons could not hold on to their first place spot as they fell to defeat 69–64. The game seemed to be going the Tritons’ way in the first half as they got up to a 15-point lead after shooting 58 (18–31) percent from the field in the half. Although, their streaky shooting came to a complete halt in the second half as they shot the ball 20 percent (5–25), drastically different from the first half. Simply, nothing would fall for the Tritons in the second half and as a result, were outscored 40–22 in the half. Even with a poor shooting display in the second half, somehow, the Tritons were still in the game late on with less than three minutes remaining, only down by a mere point, 61–60. However, Chico State was able to make a couple more plays in the last minutes of the game to earn a well-fought victory. Individually, Klie had it going on the night with a game-high 24 points off of 8-for-16 shooting including five rebounds, three assists and two steals. Oshita scored 16 points and seven rebounds. Sometimes that is all it comes down to, who makes plays at the crucial points of the game and unfortunately, the Tritons did not have the best of second half’s on the night and paid the price. They will look at tapes and improve what needs to be improved and move on like any great team does. After the two-game stint on the road, the Tritons will be back at RIMAC Arena for a pair of games where they will battle it out versus Cal State Monterey Bay on Friday, Feb. 3, for Spirit Night. Then on Saturday, Feb. 4, the Tritons will host Cal State East Bay. The Tritons beat both teams in their first meetings of the season and will look to take the season series against both this week. Both games are set for a 7:30 p.m. tip off.